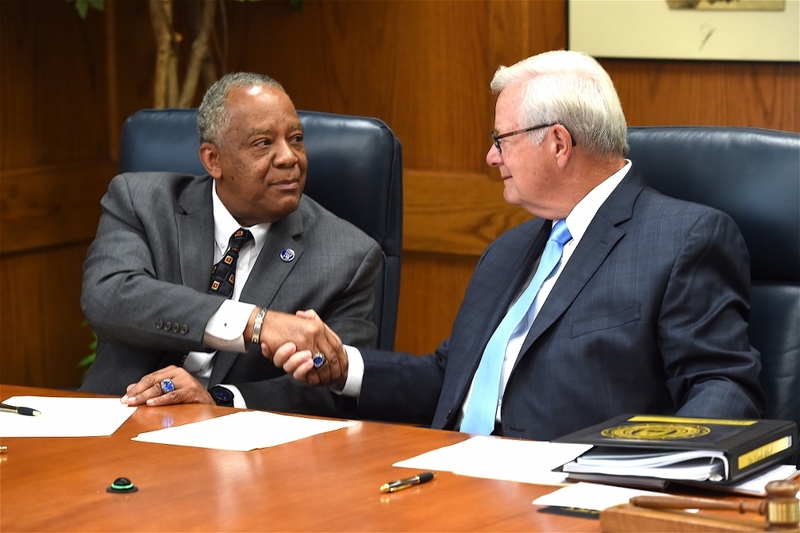 On Monday, April 1, 2019, Fayetteville State University (FSU) will host approximately 75 representatives from eleven North Carolina Community Colleges that have partnered with Fayetteville State University (FSU) to offer $10,000 ($10 K) Degree Pathway. Launched by FSU Chancellor James Anderson last August as an alternative to the high-cost programs offered by for-profit institutions, the $10 K Degree Pathway permits associate degree graduates of NC Community Colleges to earn a bachelor's degree in one of FSU's ten online degree programs for maximum out-of-pocket costs of $10,000, that's approximately $5,000 at the community college and $5,000 at FSU. Students eligible for federal or state need-based grants will likely pay out-of-pocket costs much less than $10,000. Initially, FSU planned partnerships with five community colleges for the first year of the program, but the number seeking to participate has grown to eleven. The Convening will bring together community college and FSU faculty staff to clarify program requirements, establish processes to facilitate smooth transition from community colleges to FSU, and plan joint marketing and recruitment. Suzanne Walsh, former Deputy Director of Postsecondary Success at the Bill & Melinda Gates Foundation, will deliver the keynote address. Dr. Walsh played a pivotal role in establishing the Frontier Set, a group of 31 universities and system offices committed to increasing degree attainment among populations previously underserved by higher education. Funding FSU has received as a Frontier Set member is helping to support the Convening. North Carolina Community College participants are: Fayetteville Technical, Bladen, Blue Ridge, Brunswick, Central Carolina, Davidson County, Guilford Technical, Isothermal, Johnston, Piedmont, and Richmond. For more information, contact Jon Young, 910-672-2489; jyoung@uncfsu.edu.